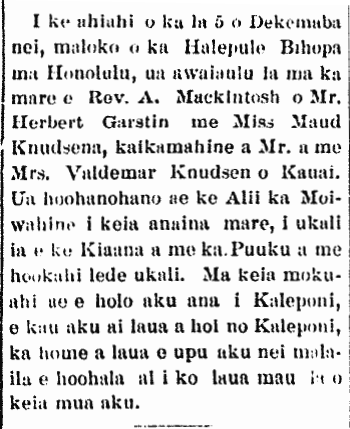 More on the Liliuokalani Church clock, 1892. Her Majesty’s Gift to Liliuokalani Church. Liliuokalani Church clock presented by the Queen, 1892. THE QUEEN IN THE SEA SPRAY OF PUAENA. Where did all of these treasures from the Kingdom go? 1922. THERE ARE MANY OLD THINGS PLACED ON DISPLAY. There are many old things from the monarchial period saved as memorabilia on display in the window of the business of Hawaiian News Co., which is headed by John H. Soper, the first General of the Hawaiian National Guards [Pualikoa Kiai Lahui Hawaii]; and amongst the old things is the sword of King Kalakaua, memorabilia from the P. G. [Provisional Government; aupuni kuikawa], and many various documents. There also is a ticket signed by G. E. Smithies of the treasury office, for the receipt of the crown and sword of Kalakaua and many other items within Iolani Palace at the time, and now the Executive Building [Hale Mana Hooko]. Near the sword is a written document, explaining that it was presented to Colonel Soper (that being Soper’s rank at the time) from James W. Robertson, the first chamberlain of the King, by order of Sanford B. Dole, and it was written on the 18th of January, 1893, the day after Queen Liliuokalani was driven from the throne. There are also proclamations signed by President Dole and the ministers of the P. G. giving authority to John H. Soper, the one who was appointed as marshal of the republic of Hawaii, to proclaim martial law. There are also several documents sent to Marshal Soper from President Dole ordering Soper to circulate the proclamations should the troops of the Provisional Government be waged war upon. There is also an order giving authority to Marshal Soper to arrest some men here in Honolulu, should they defy the government. In the list of names of those people are: Charles J. McCarthy, former mayor of Hawaii; also C. B. Wilson, marshal of the kingdom under Queen Liliuokalani; Samuel Parker and some other former ministers; along with other important people of the time amongst the Hawaiians. Also in the window is a portrait painted of President Dole and also of General Soper in full dress, in the role of General of the Republic of Hawaii; and so too with other important people during the time of the overthrow of 1893. All of the appointment documents of General Soper as a marshal [ilamuku] for the kingdom signed by King Kalakaua from 1884 to 1886, and also the appointment as marshal by President Dole for the republic of Hawaii, and the appointments as colonel and brigadier general for the National Guards, can all be seen in the window. Ka Nupepa Kuokoa, Buke LXI, Helu 39, Aoao 1. Sepatemaba 28, 1922.